Will far-right populist “peroxide-blond crusader” Geert Wilders be the Netherlands’ new prime minister? And why does he spend so much time in Hungary? On March 15th the Netherlands will elect its new Parliament, the Tweede Kamer or Lower House. According to opinion polls the far-right Freedom party might come out ahead and Wilders has a good chance to become the next prime minister. Some call the 53-year-old Wilders the Dutch Donald Trump; their politics and even their hair colors are similar. “These elections are historic, because the Netherlands can choose on the 15th of March if we want to give our land away further or if we are going to recapture it,” Wilders said. The most likely scenario is, that the Freedom party will win the election by becoming the largest party in the Lower House, but still won’t be able to form a government. His opponents will try to patch together a multiparty coalition to prevent a far-right coup d’état. “Dutch values are based on Christianity, on Judaism, on humanism. Islam and freedom are not compatible,” thunders Wilders. He is a Eurosceptic, hates Brussels bureaucrats and wants to close all mosques. He calls Islam an ideology that poses an existential threat to core European values and wants to ban the Quran, seal the nation’s borders and allow absolutely no immigrants from Islamic countries. 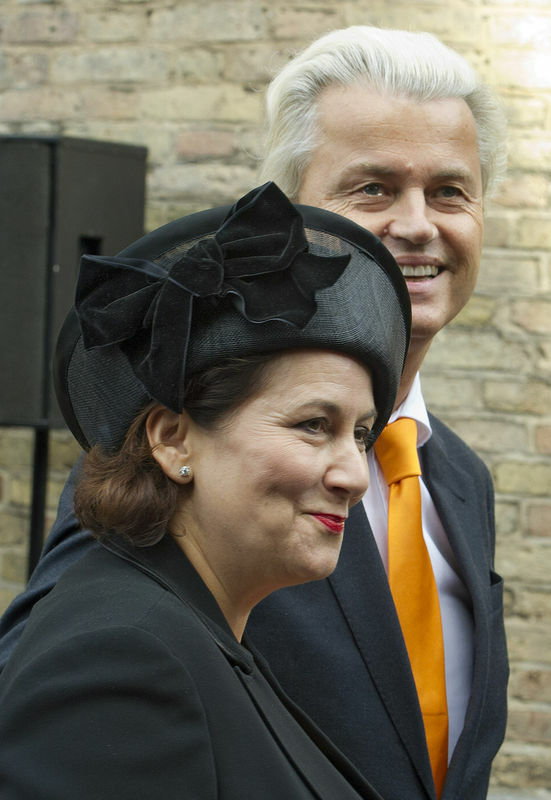 Geert Wilders and his Hungarian-born wife Krisztina Márfai. Wilders also maintains close ties to Hungary. 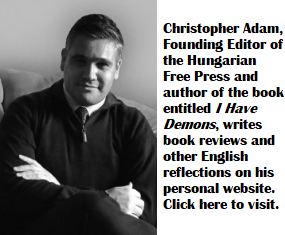 In 1992 he married a Hungarian woman, Krisztina Márfai, and together they spend summers at Lake Balaton and visit his wife’s village, Nyírparasznya, a small hamlet in Szabolcs-Szatmár county close to the Ukrainian border. Wilders feels safe there although his body guards are with him all the time. He does not take chances since Pim Fortuyn, another far right Dutch politician, was assassinated in 2002. “I have one message to the Dutch people, and that is, if you want to regain your country, if you want to make the Netherlands for the people of the Netherlands, then you can only vote for one party.” This is almost verbatim the same message Hungarian voters hear from Viktor Orbán and I was not surprised when in a Facebook entry Wilders mentions his close relationship with Orbán; they even had coffee together. How much was his campaign aided by Steve Bannon? The first is true, though quite unlikely; the second is definitely not true. For most of the past year and a half, the Freedom Party was ahead of all the other parties in the polls. But that’s in part because the Dutch party system is very splintered. Its fragmented character meant that Wilders’ party could outrank the other parties by polling around 20% of the vote. Over the last three months, the Freedom Party has kept losing support in those polls. It is now down to just 14%. It’s no longer in first place either; Prime Minister Rutte’s liberal VVD is at 17%. Of course the events of this weekend have made the outcome more unpredictable. There’s a chance that the Dutch-Turkish crisis and the riot in Rotterdam on Saturday night will drive angry right-wing voters back to the Freedom Party. But there’s an equal chance that it will make voters rally behind the Prime Minister, who has taken a very hard line. The very first polling data gathered since the crisis escalated are contradictory. According to one poll, it has not changed many voters’ minds. According to another, both Rutte and Wilders can expect some gains. In both cases, the Freedom Party is trailing the VVD by at least as much as before. Considering the unpredictability of it all and recent polling fails, sure, the Freedom Party *might* still come out ahead – but it’s not especially likely. Meanwhile, Wilders definitely does not have “a good chance” to become the next Prime Minister. Even if his party enjoys a significant last-minute swing in the polls, it won’t surpass 20% of the vote. That’s very, very far from a parliamentary majority. He would need not one, but at least two – likely three – coalition partners. Which is problematic since every single other major party has already vowed they will not form any coalition government with Wilders, let alone one with him as Prime Minister. Rutte’s VVD is the most right-wing of the mainstream parties, and he has been exceptionally resolute that he will never govern with Wilders, repeating over and again, and to Wilders’ face in last night’s election debate, that, no way, it’s not going to happen, never. Now one can still conjure up some hypothetical scenario in which Wilders gets the nod anyway. But things would have to take some very extreme turns. His party would need to leave all rival parties behind by humiliating margins, forcing Rutte to resign or eat his words, and the Christian-Democrats to go back on their promise not to govern with Wilders as well. The polls would have to be much more wrong than they were with the US election or the Brexit referendum. And more than one center-right party would have to be forced into humiliating climb-downs, bitter internal feuds, and probably leadership changes too, to make this scenario possible. A “good chance” it’s not. Nice summary of the situation – but we can’t dismiss as “untrue” the suggestion that Wilders may become Holland’s next PM. Let’s wait for the outcome, before we proclaim certitude. Politics has been known to make for strange bedfellows. Witness how quickly the venom between Cruz and Trump turned into mutual admiration. As for the Wilders’ low percentages: Trump was catapulted into the White House with the support of just over 20% of the Americans that were eligible to vote (half of the electorate chose not to cast a ballot.) Let’s hope, the Dutch will retain their sanity – and refrain from putting an Orbán clone into power. Better still, let’s hope, the “center” in Europe and America, can finally come to its senses, and generate policies, governance, and a LANGUAGE, that takes the wind out of the sails of the rising neo-fascists counterrevolution. Wilders, Le Pen, Trump, Orbán, Putin came to prominence because of the failure of the “Liberal Class” to manage the transition from the machine age to the cyber age. We’re in for an alarming ride. Let’s not be complacent. Wilders is back in the wilderness. 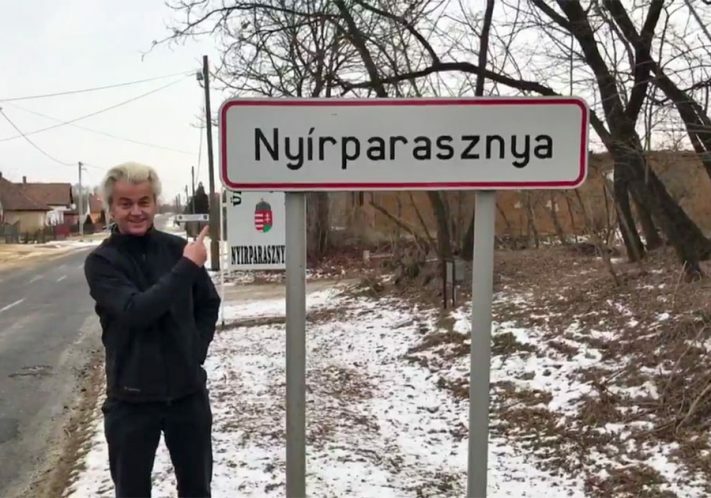 He belongs in the backwaters of Nyírparaszna, rather than at the head of the ultra-right populist counterrevolution in Europe. Kudos to the people of Holland.